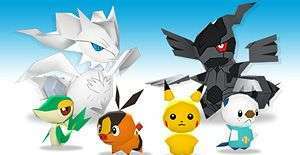 Those gamers who have been craving a 3D Pokemon experience will have to wring out their underwear because Super Pokemon Rumble is set to hit the Nintendo 3DS in Europe on 2nd December 2011. Utilising the 3DS’ Street Pass feature, Pokemaniacs can increase their chances of snagging a mythical or legendary Pokemon and battle the Pokemon of other players that they pass, as well as connecting wirelessly to mates and tackling the game’s levels in co-op play. The first Pokemon game created exclusively for Ninty’s 3D handheld, Super Pokemon Rumble features more than 600 wind-up Toy Pokemon to collect and battle with. If regular solo and paired battles were tough, this time out, your Toy Pokemon can face dozens of foes at once in frenetic real time scraps and the game features giant boss Pokemon to test your mettle. The game hits shelves on 2nd December, just in time to fill Pikachu-packed crimbo stockings.